I was standing in a waiting room of a doctor’s office with my parents and my three little boys. My mom was seeing the doctor. My dad and I were entertaining the kids. It had been about an hour when my mom finally came out. As we stood at the counter waiting to make another appointment, I saw this posted to the wall in the receptionist’s workspace. 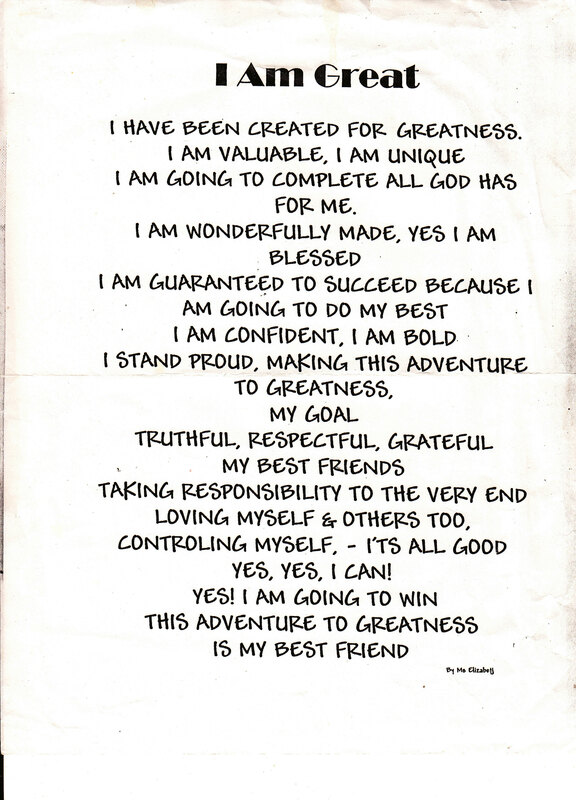 It was an 8 1/2 by 11 inch piece of paper that read, “I Am Great” and I read it out loud to my kids and my father. When the clerk came to her desk I said, “I love that. I really needed to read that today!” She said she wrote it when her kids were small. Then she did a remarkable thing. She took it off the wall and gave it to me. Thank you Ms. Elizabeth! Where ever you are!